Broadway theatre, [nb 1] commonly known as Broadway, refers to the theatrical performances presented in the 41 professional theatres, each with 500 or more seats located in the Theater District and Lincoln Center along Broadway, in Midtown Manhattan, New York City. Along with London's West End theatre, Broadway theatre is widely considered to represent the highest level of commercial theatre in the English-speaking world. A theater, theatre or playhouse, is a structure where theatrical works or plays are performed, or other performances such as musical concerts may be produced. While a theater is not required for performance, a theater serves to define the performance and audience spaces. The facility is traditionally organized to provide support areas for performers, the technical crew and the audience members. 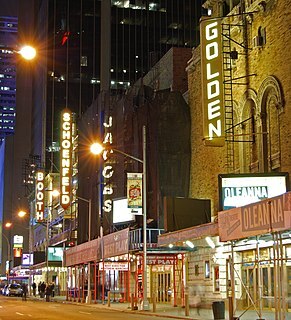 New York City's Theater District is an area in Midtown Manhattan where most Broadway theaters are located, as well as many other theaters, movie theaters, restaurants, hotels, and other places of entertainment. It is bounded by West 40th Street on the south, West 54th Street on the north, Sixth Avenue on the east and Eighth Avenue on the west, and includes Times Square. The Great White Way is the name given to the section of Broadway which runs through the Theater District. Broadway is a road in the U.S. state of New York. Broadway runs from State Street at Bowling Green for 13 mi (21 km) through the borough of Manhattan and 2 mi (3.2 km) through the Bronx, exiting north from the city to run an additional 18 mi (29 km) through the municipalities of Yonkers, Hastings-On-Hudson, Dobbs Ferry, Irvington, and Tarrytown, and terminating north of Sleepy Hollow in Westchester County. 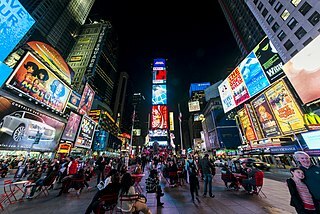 New York City received an eighth consecutive annual record of approximately 62.8 million tourists in 2017, counting not just overnighters but anyone visiting for the day from over 50 miles away, including commuters... Overall the city welcomed 38 million visitors who stayed overnight of which 13.3 million were international in 2018. Major destinations include the Empire State Building, Ellis Island, the Statue of Liberty on Liberty Island, Broadway theatre productions, Central Park, Times Square, Coney Island, the Financial District, museums, sports stadiums, luxury shopping along Fifth and Madison Avenues, entertainment events such as the Tribeca Film Festival, Randalls Island music festivals such as Governors Ball, Panorama and Electric Zoo, and free performances in Central Park at Summerstage and Delacorte Theater. Many New York City ethnic enclaves, such as Jackson Heights, Flushing, and Brighton Beach are major shopping destinations for first and second generation Americans up and down the East Coast. The Broadway League, formerly the League of American Theatres and Producers and League of New York Theatres and Producers, is the national trade association for the Broadway theatre industry based in New York, New York. Its members include theatre owners and operators, producers, presenters, and general managers in New York and more than 250 other North American cities, as well as suppliers of goods and services to the theatre industry. Martin Allen Shefter is an American political scientist and author, noted for his research on New York City politics and on how changes in the international system shape political institutions and the conduct of politics in the United States. Richard Charles Rodgers was an American composer of music, with over 900 songs and 43 Broadway musicals, leaving a legacy as one of the most significant composers of 20th century American music. He is best known for his songwriting partnerships with the lyricists Lorenz Hart and Oscar Hammerstein II. His compositions have had a significant impact on popular music. New York did not have a significant theatre presence until about 1750, when actor-managers Walter Murray and Thomas Kean established a resident theatre company at the Theatre on Nassau Street, which held about 280 people. 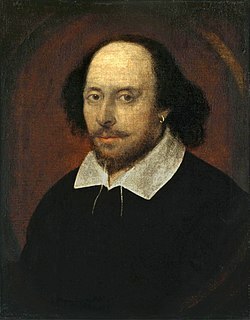 They presented Shakespeare plays and ballad operas such as The Beggar's Opera . In 1752, William Hallam sent a company of twelve actors from Britain to the colonies with his brother Lewis as their manager. They established a theatre in Williamsburg, Virginia and opened with The Merchant of Venice and The Anatomist. The company moved to New York in the summer of 1753, performing ballad operas and ballad-farces like Damon and Phillida. The Revolutionary War suspended theatre in New York, but thereafter theatre resumed in 1798, the year the 2,000-seat Park Theatre was built on Chatham Street (now called Park Row). The Bowery Theatre opened in 1826,  followed by others. Nassau Street is a street in the Financial District of New York City. It is located near Pace University and City Hall. It starts at Wall Street and runs north to Spruce Street at the foot of the Brooklyn Bridge, located one block east of Broadway and east of Park Row, in the borough of Manhattan. The Beggar's Opera is a ballad opera in three acts written in 1728 by John Gay with music arranged by Johann Christoph Pepusch. It is one of the watershed plays in Augustan drama and is the only example of the once thriving genre of satirical ballad opera to remain popular today. Ballad operas were satiric musical plays that used some of the conventions of opera, but without recitative. The lyrics of the airs in the piece are set to popular broadsheet ballads, opera arias, church hymns and folk tunes of the time. William Hallam was an English theatre manager who organized the company that gave the first professionally produced theatrical performances in the New World. Niblo's Garden was a New York theatre on Broadway, near Prince Street. It was established in 1823 as "Columbia Garden" which in 1828 gained the name of the Sans Souci and was later the property of the coffeehouse proprietor and caterer William Niblo. 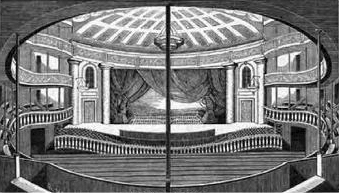 The large theatre that evolved in several stages, occupying more and more of the pleasure ground, was twice burned and rebuilt. On September 12, 1866, Niblo's saw the premiere of The Black Crook, considered to be the first piece of musical theatre that conforms to the modern notion of a "book musical". Palmo's Opera House was a 19th-century theatre in Manhattan, New York that was located on Chambers Street between Broadway and Centre Street. It was one of the earliest opera houses in New York before it was converted into one of the earliest Broadway theatres. The theatre was conceived by Ferdinand Palmo, an Italian immigrant and successful restaurateur in New York City. It was located inside the former Stoppani's Arcade Baths building. Modest alteration to the building was done in 1843 to convert the building into a theater. Edwin Thomas Booth was an American actor who toured throughout the United States and the major capitals of Europe, performing Shakespearean plays. In 1869, he founded Booth's Theatre in New York. Some theatrical historians consider him the greatest American actor, and the greatest Prince Hamlet, of the 19th century. His achievements are often overshadowed by his relationship with his brother, actor John Wilkes Booth, who assassinated President Abraham Lincoln. Prince Hamlet is the title role and protagonist of William Shakespeare's c. 1600 tragedy Hamlet. He is the Prince of Denmark, nephew to the usurping Claudius, and son of King Hamlet, the previous King of Denmark. At the beginning of the play, he struggles with whether, and how, to avenge the murder of his father, and struggles with his own sanity along the way. By the end of the tragedy, Hamlet has caused the deaths of Polonius, Laertes, Claudius, and two acquaintances of his from the University of Wittenberg Rosencrantz and Guildenstern. He is also indirectly involved in the deaths of his love Ophelia (drowning) and of his mother Gertrude. Broadway's first "long-run" musical was a 50-performance hit called The Elves in 1857. In 1870, the heart of Broadway was in Union Square, and by the end of the century, many theatres were near Madison Square. Theatres did not arrive in the Times Square area until the early 1900s, and the Broadway theatres did not consolidate there until a large number of theatres were built around the square in the 1920s and 1930s. New York runs continued to lag far behind those in London,  but Laura Keene's "musical burletta" The Seven Sisters (1860) shattered previous New York records with a run of 253 performances. It was at a performance by Keene's troupe of Our American Cousin in Washington, D.C. that Abraham Lincoln was shot. Charles H. Hoyt's A Trip to Chinatown (1891) became Broadway's long-run champion, holding the stage for 657 performances. This would not be surpassed until Irene in 1919. In 1896, theatre owners Marc Klaw and A. L. Erlanger formed the Theatrical Syndicate, which controlled almost every legitimate theatre in the US. for the next sixteen years. However, smaller vaudeville and variety houses proliferated, and Off-Broadway was well established by the end of the 19th century. A Trip to Coontown (1898) was the first musical comedy entirely produced and performed by African Americans in a Broadway theatre (largely inspired by the routines of the minstrel shows), followed by the ragtime-tinged Clorindy: The Origin of the Cakewalk (1898), and the highly successful In Dahomey (1902). 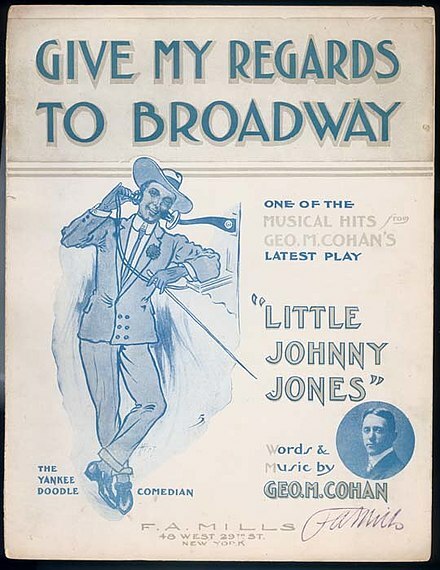 Hundreds of musical comedies were staged on Broadway in the 1890s and early 1900s made up of songs written in New York's Tin Pan Alley involving composers such as Gus Edwards, John Walter Bratton, and George M. Cohan ( Little Johnny Jones (1904), 45 Minutes From Broadway (1906), and George Washington Jr. (1906)). Still, New York runs continued to be relatively short, with a few exceptions, compared with London runs, until World War I. 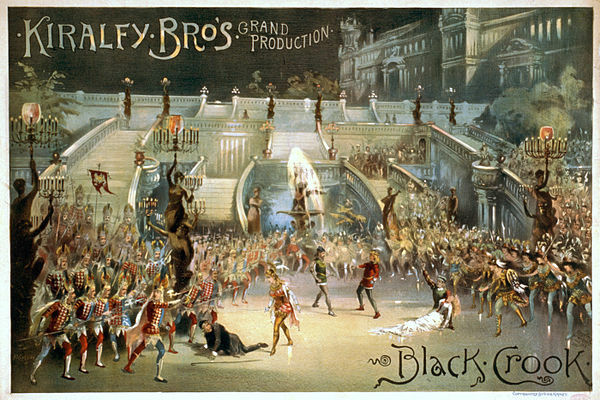 A few very successful British musicals continued to achieve great success in New York, including Florodora in 1900–01. During this time, the play Lightnin' , by Winchell Smith and Frank Bacon, became the first Broadway show to reach 700 performances. From then, it would go on to become the first show to reach 1,000 performances. Lightnin' was the longest-running Broadway show until being overtaken in performance totals by Abie's Irish Rose in 1925. The motion picture mounted a challenge to the stage. At first, films were silent and presented only limited competition. By the end of the 1920s, films like The Jazz Singer were presented with synchronized sound, and critics wondered if the cinema would replace live theatre altogether. While live vaudeville could not compete with these inexpensive films that featured vaudeville stars and major comedians of the day, other theatre survived. The musicals of the Roaring Twenties, borrowing from vaudeville, music hall and other light entertainments, tended to ignore plot in favor of emphasizing star actors and actresses, big dance routines, and popular songs. Florenz Ziegfeld produced annual spectacular song-and-dance revues on Broadway featuring extravagant sets and elaborate costumes, but there was little to tie the various numbers together. Typical of the 1920s were lighthearted productions such as Sally ; Lady Be Good ; Sunny ; No, No, Nanette ; Harlem; Oh, Kay! ; and Funny Face . 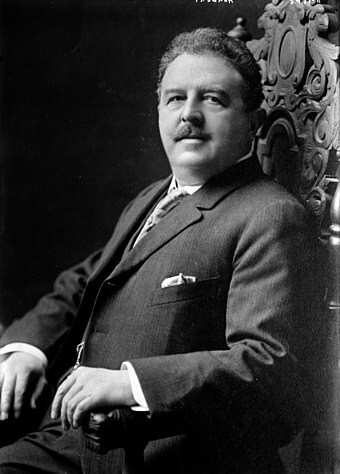 Their books may have been forgettable, but they produced enduring standards from George Gershwin, Cole Porter, Jerome Kern, Vincent Youmans, and Rodgers and Hart, among others, and Noël Coward, Sigmund Romberg, and Rudolf Friml continued in the vein of Victor Herbert. Clearly, the live theatre survived the invention of cinema. The 1920s also spawned a new age of American playwright with the emergence of Eugene O'Neill, whose plays Beyond the Horizon , Anna Christie , The Hairy Ape , Strange Interlude and Mourning Becomes Electra proved that there was an audience for serious drama on Broadway, and O'Neill's success paved the way for major dramatists like Elmer Rice, Maxwell Anderson, Robert E. Sherwood, Tennessee Williams, and Arthur Miller, as well as writers of comedy like George S. Kaufman and Moss Hart. Classical revivals also proved popular with Broadway theatre-goers, notably John Barrymore in Hamlet and Richard III, John Gielgud in Hamlet , The Importance of Being Earnest and Much Ado About Nothing , Walter Hampden and José Ferrer in Cyrano de Bergerac , Paul Robeson and Ferrer in Othello , Maurice Evans in Richard II and the plays of George Bernard Shaw, and Katharine Cornell in such plays as Romeo and Juliet , Antony and Cleopatra , and Candida . Although there are some exceptions, generally shows with open-ended runs have evening performances Tuesday through Saturday with a 7:00 p.m. or 8:00 p.m. "curtain". The afternoon "matinée" performances are at 2:00 p.m. on Wednesdays and Saturdays and at 3:00 p.m. on Sundays. This makes for an eight-performance week. On this schedule, most shows do not play on Monday and the shows and theatres are said to be "dark" on that day. The actors and the crew in these shows tend to regard Sunday evening through Monday evening as their weekend. The Tony award presentation ceremony is usually held on a Sunday evening in June to fit this schedule. In recent years, some shows have moved their Tuesday show time an hour earlier to 7:00 pm. The rationale for this move was that since fewer tourists take in shows midweek, Tuesday attendance depends more on local patrons. The earlier curtain makes it possible for suburban patrons to get home by a reasonable hour after the show. Some shows, especially those produced by Disney, change their performance schedules fairly frequently depending on the season. This is done in order to maximize access to their target audience. Some Broadway shows are produced by non-commercial organizations as part of a regular subscription season—Lincoln Center Theatre, Roundabout Theatre Company, Manhattan Theatre Club, and Second Stage Theater are the four non-profit theatre companies that currently have permanent Broadway venues. Some other productions are produced on Broadway with "limited engagement runs" for a number of reasons, including financial issues, prior engagements of the performers or temporary availability of a theatre between the end of one production and the beginning of another. However, some shows with planned limited engagement runs may, after critical acclaim or box office success, extend their engagements or convert to open-ended runs. This was the case with 2007's August: Osage County , 2009's God of Carnage , and 2012's Newsies . The classification of theatres is governed by language in Actors' Equity Association contracts. To be eligible for a Tony, a production must be in a house with 500 seats or more and in the Theater District, which criteria define Broadway theatre. Off-Broadway and Off-Off-Broadway shows often provide a more experimental, challenging and intimate performance than is possible in the larger Broadway theatres. Some Broadway shows, however, such as the musicals Hair , Little Shop of Horrors , Spring Awakening , Next to Normal , Rent , Avenue Q , In the Heights , Fun Home , Dear Evan Hansen , and Hamilton , began their runs Off-Broadway and later transferred to Broadway, seeking to replicate their intimate experience in a larger theatre. Broadway productions and artists are honored by the annual Antoinette Perry Awards (commonly called the "Tony Awards", or "Tony") which are given by the American Theatre Wing and The Broadway League, and which were first presented in 1947. The Tony is Broadway's most prestigious award, comparable to the Academy Awards for Hollywood film productions. Their importance has increased since 1967 when the awards presentation show began to be broadcast on national television. In a strategy to improve the television ratings, celebrities are often chosen to host the show, some with scant connection to the theatre. The most recent Tony Awards ceremony was held on June 10, 2018. Other awards given to Broadway productions include the Drama Desk Award, presented since 1955, the New York Drama Critics' Circle Awards, first given in 1936, and the Outer Critics Circle Award, initially presented in 1950. Hello, Dolly! is a 1964 musical with lyrics and music by Jerry Herman and a book by Michael Stewart, based on Thornton Wilder's 1938 farce The Merchant of Yonkers, which Wilder revised and retitled The Matchmaker in 1955. The musical follows the story of Dolly Gallagher Levi, a strong-willed matchmaker, as she travels to Yonkers, New York to find a match for the miserly "well-known unmarried half-a-millionaire" Horace Vandergelder. David Yazbek is an American writer, musician, composer, and lyricist. He wrote the music and lyrics for the Broadway musicals The Full Monty (2000), Dirty Rotten Scoundrels (2005), Women on the Verge of a Nervous Breakdown (2010), The Band's Visit (2017), and Tootsie (2019). Matthew Sklar is a composer for musical theatre, television, and film. His works have appeared on Broadway, the West End, and many theatres worldwide. Sklar has written primarily with lyricist Chad Beguelin, having written music for their Broadway shows The Wedding Singer, which earned him a 2006 nomination for Tony Award for Best Original Score, Elf the Musical, and The Prom. Casey Nicholaw is an American theatre director, choreographer and performer. He has been nominated for Tony Awards for directing and choreographing The Drowsy Chaperone (2006), The Book of Mormon (2011), Something Rotten! (2015), and Mean Girls (2018) and for choreographing Monty Python's Spamalot (2005) and Aladdin (2014), winning for his co-direction of The Book of Mormon with Trey Parker. He also was nominated for the Drama Desk Awards for Outstanding Direction and Choreography for The Drowsy Chaperone (2006) and Something Rotten! (2015) and for Outstanding Choreography for Spamalot (2005). Thomas Robert Kitt is an American composer, conductor, orchestrator, and musician. For his score for the musical Next to Normal, he shared the 2010 Pulitzer Prize for Drama with Brian Yorkey. He also won the Tony Award and 2008 Outer Critics Circle Award, and was nominated for a Drama Desk Award for American Idiot and Everyday Rapture. Jessica Ruth Mueller is an American actress and singer. She started her acting career in Chicago and won a Joseph Jefferson Award in 2008 for her role as Carrie Pipperidge in Carousel. In 2011, she moved to New York City to star in a Broadway revival of On a Clear Day You Can See Forever, for which she was nominated for a Tony Award. She won the 2014 Tony Award for Best Actress in a Musical for her performance as Carole King in Beautiful: The Carole King Musical. She also received two additional Tony Award best actress nominations for her roles in Waitress in 2016 and in the Broadway revival of Carousel in 2018. Pam MacKinnon is an American theatre director. She has directed for the stage Off-Broadway, on Broadway and in regional theatre. She won the Obie Award for Directing and received a Tony Award nomination, Best Director, for her work on Clybourne Park. In 2013 she received the Tony Award for Best Direction of a Play for a revival of Who's Afraid of Virginia Woolf? She was named Artistic Director of American Conservatory Theater in San Francisco, California on January 23, 2018. Brandon Jacob Uranowitz is an American stage and television actor, best known for his roles as Adam Hochberg in An American in Paris and Mendel in the 2016 Broadway revival of Falsettos. Leigh Silverman is an American director for the stage, both Off-Broadway and on Broadway. She was nominated for the 2014 Tony Award, Best Direction of a Musical for the musical Violet and the 2008 Drama Desk Award, Outstanding Director of a Play for the play From Up Here. The Chita Rivera Awards for Dance and Choreography celebrate outstanding dance and choreography in theatre, both on Broadway and Off-Broadway and in film at an annual ceremony in New York City at the Skirball Center for the Performing Arts. Now carrying the namesake of two-time Tony-winning dance icon Chita Rivera, The Rivera Awards will be presented under the auspices of American Dance Machine, an organization dedicated to the preservation of great musical-theater choreography. Barrett Wilbert Weed is an American musical theater actress and singer. She is best known for originating the role of Veronica Sawyer in the Off-Broadway production of Heathers: The Musical and the role of Janis Sarkisian in the Broadway production of Mean Girls. Lucas Hnath is an American playwright. He won the 2016 Obie Award for excellence in playwriting for his plays Red Speedo and The Christians. He won a Whiting Award. Oslo is a Tony award-winning play by J. T. Rogers, recounting the true-life, previously secret, back-channel negotiations in the development of the pivotal 1990s Oslo Peace Accords between Israel and the Palestinian Liberation Organization. The play premiered Off-Broadway in June 2016 and then transferred to Broadway in April 2017. The 72nd Annual Tony Awards were held on June 10, 2018, to recognize achievement in Broadway productions during the 2017–18 season. The ceremony was held at Radio City Music Hall in New York City, and was broadcast live by CBS. Sara Bareilles and Josh Groban served as hosts. Ashley Jini Park is an American actress, dancer, and singer. She is known for her work on Broadway as Tuptim in the 2015 revival of The King and I and for originating the role of Gretchen Wieners in the 2018 Tony-nominated musical, Mean Girls, for the latter of which she received Drama Desk Award and Tony Award nominations. Superhero is a musical with music and lyrics by Tom Kitt, and a book by John Logan. The musical premiered Off-Broadway in February 2019. Alice by Heart is a musical with music by Duncan Sheik, lyrics by Steven Sater, and a book by Sater with Jessie Nelson. The musical is inspired by Lewis Carroll's Alice's Adventures in Wonderland and was originally presented by London's Royal National Theatre in 2012. ↑ Although theater is the generally preferred spelling in the United States (see American and British English spelling differences), many Broadway venues, performers and trade groups for live dramatic presentations use the spelling theatre. ↑ The Palace Theatre closed for renovation in September 2018. It is scheduled to reopen in or around 2021. 1 2 "2017–2018 Broadway End-of-Season Statistics". Broadway League, May 29, 2018. ↑ Martin Shefter (1993). Capital of the American Century: The National and International Influence of New York City. Russell Sage Foundation. p. 10. ↑ Snyder, Robert W. The Encyclopedia of New York City (New Haven: Yale University Press, 1995), Kenneth T. Jackson, editor, p. 1226. 1 2 "Urban Development". spotlightonbroadway.com. Retrieved November 3, 2017. ↑ Kenrick, John. "Kenrick's summary of the 20th century history of theatre in New York". Musicals101.com, accessed August 26, 2011. ↑ Lubbock, Mark (1962). The Complete Book of Light Opera. New York: Appleton-Century-Crofts. pp. 807–8. ↑ Atkinson, Brooks (April 2, 1941). "Lillian Hellman's Watch on the Rhine Acted With Paul Lukas in the Leading Part" (PDF). The New York Times. Retrieved October 18, 2012. 1 2 3 Helen Epstein (March 1, 1996). Joe Papp: An American Life. ISBN 0-306-80676-2 . Retrieved February 22, 2013. ↑ "City Panel Near Vote on Save-The-Theaters Proposals". New York City: NYTimes.com. April 15, 1984. Retrieved February 22, 2013. 1 2 "Bill Summary & Status – 97th Congress (1981–1982) – H.R.6885". Thomas.loc.gov. Retrieved February 22, 2013. ↑ Lynne B. Sagalyn (2003). Times Square Roulette: Remaking the City Icon. MIT Press. ISBN 978-0-262-69295-3 . Retrieved February 26, 2013. 1 2 Peter Bosselmann (August 28, 1985). Representation of Places – Imprimé: Reality and Realism in City Design. ISBN 978-0-520-91826-9 . Retrieved February 26, 2013. ↑ "Local 802 Agreement". local802afm.org. p. 10. Retrieved August 10, 2013. ↑ "TKTS Discount Booths in NYC, Theatre Development Fund". www.tdf.org. ↑ McPhee, Ryan (July 13, 2018). "Musical Comedy The Prom Switches Theatres Ahead of Broadway Premiere | Playbill". Playbill. Retrieved July 13, 2018. ↑ McPhee, Ryan (August 9, 2018). "Tootsie Musical, Starring Santino Fontana, Sets Broadway Dates and Theater". Playbill. Retrieved August 9, 2018. ↑ "Free From Legal Battles, TO KILL A MOCKINGBIRD Will Play the Shubert Theatre on Schedule | BroadwayWorld". BroadwayWorld. May 10, 2018. Retrieved May 10, 2018. ↑ McPhee, Ryan. "Alanis Morissette Musical Jagged Little Pill Will Transfer to Broadway". Playbill . Retrieved January 28, 2019. Wikimedia Commons has media related to Broadway theatre .